Luxurious and handcrafted fine French leatherwork, Devoucoux saddlery products are designed to meet the needs of all riders and all types of mount, whether competition or leisure. 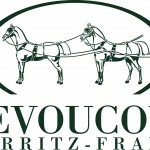 Devoucoux Custom Saddles are created in Biarritz, France, by Jean Michel Devoucoux. A confirmed event rider, Jean Michel made his very first saddle for himself. Indeed, he couldn’t find anything that would meet his demanding needs on the market; saddles that could provide perfect balance, safety and freedom for both horse and rider. Click on logo to visit Devoucoux and see their exceptional leather products. Equine Comfort Products is unsurpassed in quality, design and utility. Manufacturing since 1984… we have established our company as the premium supplier to the equestrian customer. Australian Merino Sheepskin Pads and Accessories As always Mother Nature knows best there is no man-made material that can equal the therapeutic benefits of sheepskin. Benefits include: lightweight, breathable shock absorption; total relief from pressure points; complete elimination of chafing sores and rubs; effective heat and moisture management. Equine Comfort Products are designed by active riders and competitors. WINNINGEDGE is a unique and comprehensive supplement manufactured by EquiFeast. WINNINGEDGE is packed with a range of ingredients that help to support the horse’s joints, skeleton, digestion, soft tissues, immune system, hooves, muscle development and encourage a more trainable, relaxed temperament. Essentially, WINNINGEDGE is the equivalent of a feed balancer and twelve other supplements chosen specifically for the competition horse. Joe is sponsored by Tri-Zone® Boots, designed and developed by Equilibrium Products. Built around a core principle of zoned protection Tri-Zone® Boots offer unrivalled protection, genuine impact absorption, as well as the ability to channel heat and sweat away from the skin, minimising the heating effect of boots upon vulnerable tendons. During the design process, all Tri-Zone® boots are tested for Protection, Heat Reduction, Flexibility and Weight. ICEBREAKER I Launched in 1994, Icebreaker was the first company in the world to develop a merino fibre layering system for the outdoors. It was also the first outdoor apparel company in the world to source merino directly from growers, a system it began in 1997. There are now 20-25 distinct pure merino fabrics in the Icebreaker system, covering underwear, mid layer, and outerwear. Based in Wellington, New Zealand, Icebreaker uses only pure merino hand-picked from 120 high country stations in the country’s Southern Alps to create edgy outdoor clothing that combines nature’s work with human technology and design. The company is committed to sustainability, ethical manufacturing and animal welfare. In 2008 the company launched “Icebreaker Baacode,” a pioneering supply chain transparency and traceability program. Each Icebreaker includes a unique Baacode, which enables customers to trace the garment online from rearing the sheep through to each stage of the supply chain process. Airowear is one of the UK’s leading equestrian body protector manufacturers and it’s not hard to see why. The company started trading over 20 years ago and during this time has become renowned for the quality of its body protectors. Despite being well established, Airowear moves with the times and a lot of care, attention and research goes in to the products it produces. The Outlyne for Men is an excellent example of this. The Outlyne for Men is gender specific and works with the male form. It is generously cut across the chest and shoulders to fit a masculine body shape, but still benefits from adjustable chest, waist and shoulders, and Ultraflex technology that allows the body protector to mould to the rider’s shape for additional comfort. Joe wears the Outlyne for Men and is proud to be associated with Airowear. Our expertise has been at the forefront of development over the years, producing riding headwear that is non-bulky, lightweight, comfortable and competitively priced. We have pioneered some major changes in headwear safety in recent years and are proud to be recognised by the BSI for consistency and high levels of test results. The extensive range means there will be a hat which will suit your needs whether you are having fun or competing at the highest level. MacWet Gloves are becoming the most popular sporting glove globally as sport enthusiasts discover the benefits of the unique fabrics the gloves are manufactured with giving 100% grip in wet conditions. The benefits of the gloves are obvious with the skin tight fit giving full dexterity and sensitivity in the lightweight fabrics so the wearer doesn’t feel as if they are wearing gloves.